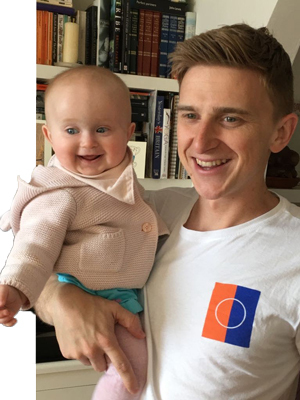 As the first man in the M&C Saatchi Group to take shared parental leave Toan Ravenscroft, business director at M&C Saatchi Sport & Entertainment, explains how stepping away has re-energised his approach to work. You’re taking three months off? Yes. To be a stay at home dad? Yes. Was it a crazy choice? I hoped not. Whilst shared parental leave is still relatively novel, I was the first in the M&C Saatchi Group and the first in my social circle to do it, taking it up always seemed entirely logical. Even before my wife was pregnant with our daughter Seren, we had discussed it. It is something I feel passionate about and my wife, a lawyer in the City who also runs her own triathlon brand, absolutely supported. We felt we should both be equally able to look after Seren and if it meant I could assist Rhian to "lean in" to quote Facebook chief operating officer Sheryl Sandberg, then all the better. Whilst SPL is government legislation, the key factors in deciding to take it up were my agency’s progressive SPL package that offered pay parity with mums on maternity leave and the unwavering encouragement from the top-to-the-bottom of the agency. Organising it was straightforward, some forms to complete on both sides, meetings with HR and then a managed handover as I transitioned off client work. There was still a fear in stepping away from the day-to-day. To drop all I had known since entering the industry – the agency buzz, the client relationships, the smart people, the intelligent thinking, the creativity… even just being in Soho. Would my colleagues and clients forget me? Would I be able to slip back into my role? Would I even want to go back? I found the best way to temper this was to detach myself from the detail – my phone remained switched off in a drawer, my emails piled up and the Slacks unread. Instead I stayed in touch through all-company meetings, informal lunches and social media. I knew it would not be the same as the countless mums who have taken six, nine or 12 months away but I was also able to reassure myself that many had done this before, and I hope I can now understand their situation a little better. I also realised that the self-doubt and questioning is both natural and a good process to undergo, to take that all-important time to reflect. As my chief executive said the day before I left, "take the time to just slow it down a bit" and aside from three house moves in three months with a six-month-old in tow, this was what I did. I ploughed my focus on to my daughter. We visited people daily, we went to the park, we laughed (a lot), we explored and while we didn’t do enough baby classes, nor make as many new friends as I’d expected, it was a brilliant, challenging, life-affirming three months. Naively, I had (multiple) lists of ideas to develop, books to read and conversations about what I could spend my "time off" thinking about. By the end of my three months, I had read about four pages of one book and scrappily developed one idea whilst fuelled by coffee. I felt refreshed (thanks in no small part to having a baby who sleeps) and reinvigorated, so much so that by my first day back I was like a kid in a sweet shop. Genuine excitement. A new perspective. A desire to work. Since being back, I am now far more ruthless with my time. I have vowed to no longer be a slave to my email inbox and I have changed my core hours, so that I start and finish earlier on three days to do the nursery run. An unexpected upshot is that I now feel a greater loyalty to the agency. Hopefully it has also given my colleagues a new perspective on me. Despite the fact SPL is "failing" based on low uptake, this will only improve if more men lean out of the workplace and/or provide the support for others to do so. Whilst the circumstances will not work for everyone and there are many options when bringing up a child, we cannot really strive for gender equality in the workplace until SPL is more normalised. By leaning out, for just a few months, it can help women to lean in – and that is a principle I would want my daughter to expect as the norm. More than taking the chance to do it, I jumped at it and I hope others will too.